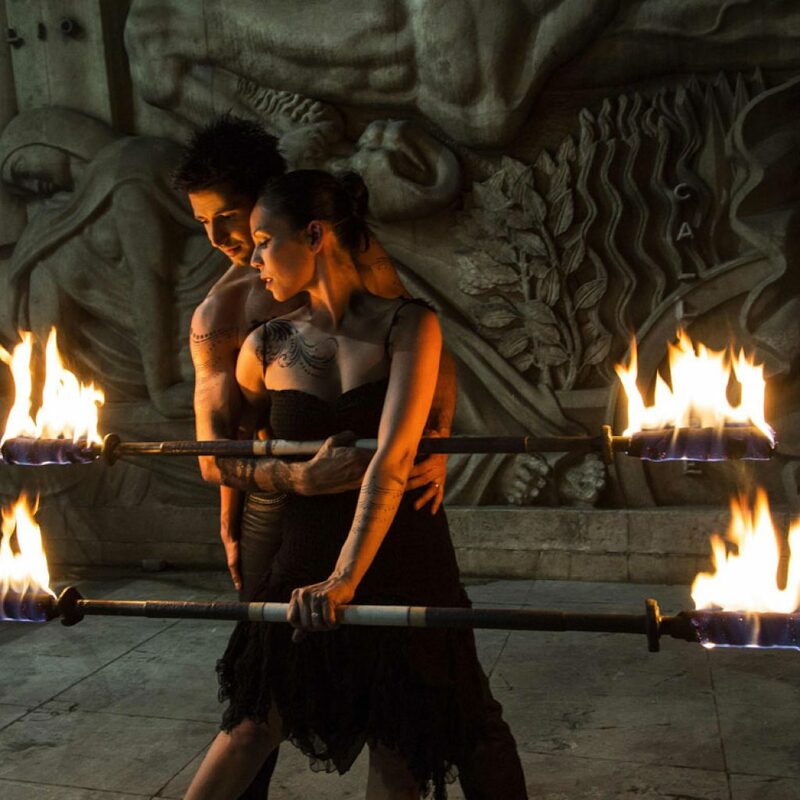 Choosing the right fire staff dimensions which will feel right & allow you to pursue your own personal style of fire dancing can be daunting. There are many variables to consider including length, weight & weight distribution. It may be helpful to seek the advise of an experienced artist. 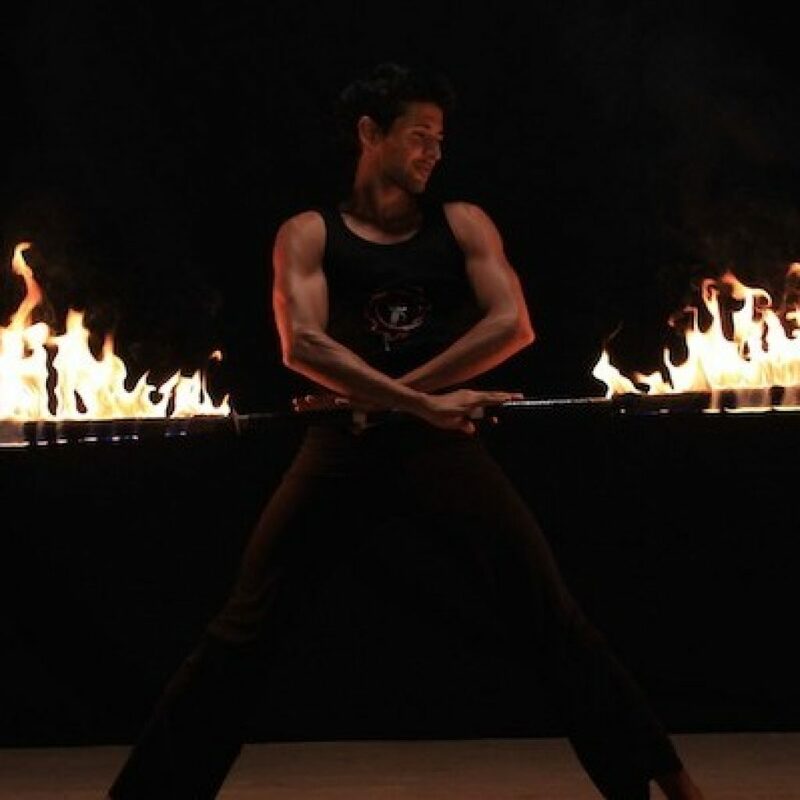 I’ve made a career of dancing with the fire staff (15+ years including 3 years onstage with the Cirque du Soleil). I’ve always designed & constructed my own fire tools and have been teaching poi, staff & swords for over 10 years. Questions about ideal staff specs have come up often from my Students but since I launched Fusion Arts Pro Fire Shop, (offering my custom-made fire staffs to the public for the first time) the questions aren’t just trickling in. They’re pouring in. Below you will find my revelations regarding fire staff specs over years of impassioned obsession and design modification. Disclaimer! Opinions vary even between professional fire dancers. This is largely due to the different styles of staff spinning. 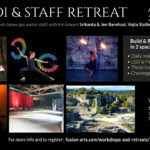 I’ve named the style I’ve developed Dance-based Fire Dance, which I teach in my instructional video series Dancing with the Fire Staff & at my annual Workshops and Fire Dance Retreats. In addition to my dance-based style, there is also contact staff, acro staff, staff juggling and short doubles, each with their own priorities regarding staff length, weight and weight distribution. Ultimately the question of which fire staff is right for you comes down to your own personal style and aspirations. At the age of 9, I learned an Indian Martial Arts style of staff spinning. In this tradition, appropriate staff length is eye-level. Following suit, I spun with staffs (both single and double) at my eye level (162cm/5’4”) for 10+ years (from age 19-30). When I quit the Cirque du Soleil and began freelancing, it became impractical to fly with long staffs as many airlines charge an additional fee for baggage over 150cm. More tips about flying with fire dance tools in my next blog- coming soon. I ended up using shorter staffs which I’d made for my partner Jen. Her eye-level staffs are 142cm (4’8”), 20cm shorter than the staffs I’d always used. Suddenly I was performing with staffs that came up to my armpit level. So what happened? It opened up a ton of possibilities for me. I was able to get into lower stances while spinning vertically which helps a ton for prepping for jumps (you gotta get down to get up). It also opened up the possibility of spinning in the internal plane and to discover isolation patterns which were inaccessible with longer staffs. After 10+ years of alternating between poi and staff as my tool of obsession, double staffs became my favorite for the first time. I attribute my new love to the reduction in length- who knew! Currently I recommend a staff length at armpit level for those pursuing my dance-based style of fire dance. Because arm-length varies from person to person, it may be more accurate to measure from wrist to wrist when your arms are stretched out in a T.
I’ve made it a part of my body movement (plus the public likes it when you get close to the fire) but if you feel you would rather do less torso & plane bending you could reduce the length by 5-10cm while maintaining the image of you with a full length staff. It’s just my personal preference, but I wouldn’t advise reducing the length much beyond that. My rule of thumb goes, if a warrior stance with your staffs makes you look more like a feisty majorette than a warrior, your staffs are too short (I can almost see the hate mail streaming in). Many people (particularly in Europe and Australia) like spinning with short staffs, especially when spinning doubles. While I find 99% of this about as interesting to watch as those guys who direct airplanes on the runway, there are some notable exceptions. Dan Miethke (one of the Artists I profile in the inspirational section of Dancing with the Fire Staff) spins short doubles and hasn’t forgotten the importance of bodylines or the image as a whole on stage. For my style of dance with the fire staff a light weight staff is ideal. That’s because I’m spinning fast, jumping, turning and stopping/ changing the direction of the staff to bring variance to my routine. Because I want to spin a long staff, with as much fire on the ends as possible, strength to weight ratio is of prime importance, which is why I use only the highest-grade titanium tubes to build my pro fire staffs. In fact, I’ve gone to great lengths to research and source light-weight materials, ultimately resorting to the aerospace industry for parts! My pro fire staffs weigh between 500-750 grams and I wouldn’t want them any heavier. Thanks to the light weight tubing, the majority of the weight is on the ends (in the wick and fuel). This weight distribution helps the staff to stay in plane (think poi). Generating momentum is easy and a matter of giving the ends small pushes and tugs (again like poi). contact staff spinners generally prefer a heavier staff which is weighed more evenly throughout. For many, the heavier the better and fixing a wooden dowel within the metal tubing is a common design. The truth is you can do contact with my staffs and you can jump and pirouette and spin fast with a contact staff. I have contact moves in my staff choreography and its fine- I’ve learned to give the staff a bit of an extra push. I’ve also had students with heavy contact staffs at my workshops and retreats. While they struggle a bit with some things, like changing directions, staying in plane, etc, they’ve proven that it is possible, if not ideal. What are my personal fire staff specs? I use the same length of fire staff for both single staff and double staff although my preferences change periodically. Up until recently I was using 25,4mm (1″) x 142cm (4’8″) tubes. My isis wicks made of 6mm rope were 22cm in length. But this Spring we created a 4 person Fire Dance Act with 3 Female Artists. As the 19mm (.75″) tubing is preferable for those with smaller hands I decided to try to adapt and allow us to use the same staffs throughout the act. Because their arm spans are shorter than mine, we’ve reduced our staff length by 2cm but to maintain the same amount of fire and weight distribution we added 1cm of wick to each end so that now we are using 19mm x 140cm tubing with 23cm of 6mm rope. Another recent change to our pro fire staffs is the light weight silicone flame guards replacing the heavier leather strap. What will be the best fire staff for you? By now you have an idea about the elements to consider to create the ideal fire staff. Before ordering your pro fire staff, have a peak at our past product specs on Instagram. This can give you an idea of what total weight you can achieve by playing with the different elements. And if you still have questions, send me a message!